Readers and writers have plenty to take advantage of in Houston: diverse reading series, a slew of writing workshops, and amazing independent bookstores. One of the best hidden secrets for emerging writers in the Houston area is Glass Mountain magazine. The magazine comes out of the University of Houston, which also houses the nationally renowned University of Houston Creative Writing Program (UH CWP). Besides publishing new work, Glass Mountain offers community to new writers with a reading series. The next reading comes up this Tuesday, December 5th, 7:00 pm at Brasil in Montrose – but if you can’t attend there’s still plenty to take advantage of! Glass Mountain magazine is celebrating its 10th anniversary this year. The upcoming issue, which will be released at a launch party on April 19, is a landmark event for this undergraduate literary publication. The journal’s name is inspired by a story from local legend Donald Barthelme. Glass Mountain’s staff and editors in fiction, art, reviews, nonfiction, and poetry are all undergraduate students at UH, who receive submissions from the local community and internationally. Singular in its mission, it exists exclusively for writers who do *not* have an MFA or other higher degree in creative writing. When we think of writing conferences, we always think they take place somewhere in the Northeast, along a beautiful coast, in a remote location, or in a popular tourist destination. Houstonians however do have access to one of the best writing conferences right here in Houston. Boldface is a summer writing conference run by Glass Mountain, the University of Houston undergraduate literary journal. The journal caters to undergraduates across the nation, but the Boldface Conference is open to any emerging writer who is interested in signing up. Inprint blogger Sara Balabanlilar interviewed Joseph Roberts, the head fiction editor of Glass Mountain, to get more information about this year’s Boldface Conference. The visiting writers to the conference include poet Blas Falconer, non-fiction writer Gail D. Storey, and novelist Coert Vorhees. To register and learn more about the Boldface Conference click here. SARA: Tell us a little bit about Boldface. 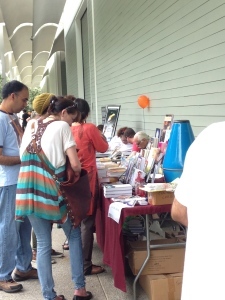 Although the weather was cloudy and grey, spirits were bright at MenilFest 2015 last Saturday. MenilFest is a multi-pronged cultural celebration, combining an indie book fair, literary lectures, musical performances, film screenings, and more. The indie book fair flanked the northern, eastern, and southern sides of The Menil Collection museum building, providing an opportunity for local ‘zines, publishers, authors, and nonprofit organizations (I spied Friends of the Houston Public Library, the Hare Krishna Cultural Center, and the High School for the Performing and Visual Arts, among others) to display their wares and welcome conversation. There was printed matter for everyone—romances, poetry, mysteries, cookbooks, Spanish-language, spiritual, YA, and even some book-related crafts. For emerging writers, there’s always the moment when the workshop ends and you’re left wondering what the next step will be. 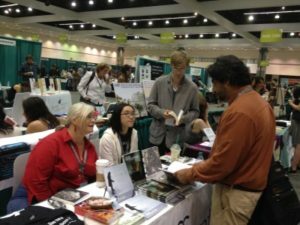 Writers’ conferences—which combine intensive workshops, master classes, and readings—are a great way to sustain the momentum of writing and revision in a community of peers. While many conferences involve cross-country travel and fees that can range from hundreds to thousands of dollars, the Boldface Conference—housed here in Houston—offers a dynamic experience at a fraction of the cost of many programs. The Boldface conference fee for the week is $125 for students and $200 for non-students; registration is open until May 9. Click here to learn more. More Literary Happenings in Houston! Calling all Houston Readers and Writers! We all know about the writing scene in Houston—Poison Pen Reading Series, Lit Fuse, Gulf Coast Reading Series, and, we can’t forget, the Inprint Margarett Root Brown Reading Series—so what’s next? Glass Mountain Reading Series! 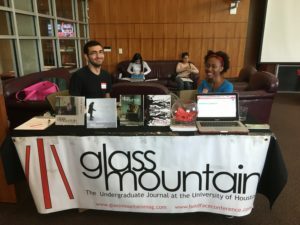 Glass Mountain, an undergraduate literary journal at the University of Houston, has recently gone national. Accepting works from all over the states, this literary journal is bringing its work to you here in Houston, every third Tuesday of the month, at Brasil Café. The Glass Mountain Reading Series is a new series primarily geared to emerging writers who are looking to improve their work and participate in the writing community. In an interview with managing editor Steven Simeone and coeditor Brett Forsberg, they explain their reasons for starting the Glass Mountain Reading Series and tell Inprint some of the journal’s goals and plans for this year. Brett: I got this idea that everybody working at the magazine should bring something to add to the magazine. We’ve been around for at least 7 academic years and we became national about a year and a half ago. Slowly, the magazine has started growing and we wanted to help that by kicking off with a reading series. And the best part about the reading series is that we have a visiting writer come to inspire readers and to cultivate the undergraduate writing community. Steven: Also, most of the undergraduate writers are scared about going up to read, so it helps to bring in visiting writers who have done multiple readings before, but still feel somewhat timid about going up to read.